In Central British Columbia, rock units prospective for porphyry and other styles of base and precious metal mineralization are covered by extensive regions of barren Neogene basalt flows, most importantly the Miocene to Pleistocene Chilcotin Group. Effective exploration of targets covered by Chilcotin Group basalts is challenging because of the masking effect these basalts have in interpreting geophysical data (e.g., high magnetic susceptibility) and regional stream and lake sediment geochemistry. 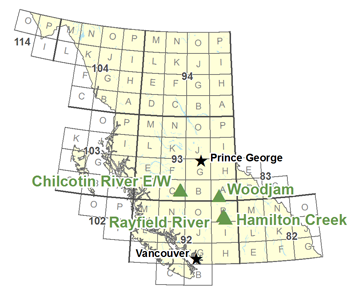 Geoscience BC Report 2013-17 contains the results of samples collected over known porphyry style Cu-Au mineralization at the Deerhorn and Three Firs prospects in the Woodjam Area. A variety of sample media have been collected, including Ae-horizon and B-horizon soils, spruce bark and spruce twigs as well as a limited number of clay and carbonate amygdules in basalt. The 54 page report is presented in pdf format, analytical data have been provided in Excel (XLS) format and lab reports for organo-sulphur and soil gas hydrocarbon predictive geochemistry have also been provided in pdf format.